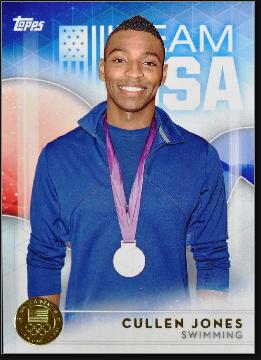 Cullen Andrew Jones was born February 29, 1984 in the Bronx and grew up in Irvington. Cullen had already begun swimming by the time the family moved to New Jersey. He had nearly drowned at a water park as a 5-year-old and his parents immediately put him into a swim program. He began competing as a member of Metro Express in West Orange, and then for Jersey Gators in Cranford. Cullen attended St. Benedict’s Prep in Newark, where he was a champion swimmer and diver for coach Glenn Cassidy. Cullen was recruited by a number of colleges. He attended North Carolina State and swam four varsity seasons for the Wolfpack, using his explosive 6’5” frame to distinguish himself as a first-class freestyle sprinter. At 22, Cullen signed a contract with Nike and, in the summer of 2006, won the 50 meters crown at the Pan pacific Championships in Canada. He also was a member of the record-smashing 4 x 100 freestyle relay squad along with Neil Walker, Jason Lezak and Michael Phelps. The same group won gold again the following spring at the 2007 World Aquatic Championships in Australia. Cullen made the 2008 Olympic team. He did not medal in the 50 meters, but won gold along with Phelps, Lezak and Garrett Weber-Gale in the 4 x100, setting a world record in the process. After returning from Beijing, Cullen threw himself into USA Swimming’s “Make A Splash” program to teach kids how to swim. One of the primary aims of the organization is swimming training for African American children, who are three times more likely to drown than white children. To date more than 3 million young people learned to swim in the program. At the 2012 Olympics, Cullen won two silver medals—one as a member of the 4 x 100 relay team and another finishing second to Florent Manaudou by .2 seconds. He also took home gold as a member of the 4 x 100 medley team, although he did not swim in the finals. Cullen hoped to qualify for a third Olympics in 2016 but fell agonizingly short, finishing inches behind Nathan Adrian and Anthony Ervin.